I got these samples from an Innisfree store. I don't trust buying samples anymore ever since we've had an Aritaum store open up in my city that actually sells high-end Korean cosmetics and I've noticed a difference in scent and texture in some of them. So from now on I'll only review (and use, quite frankly) samples that were given to me at a retail store. Anyway, I'm not a particular Innisfree cleanser fan. I tried the Innisfree Jeju Volcanic Pore Cleansing Foam but it was nothing compared to the Skinfood Egg White Pore Form that I use in my morning skin routine. 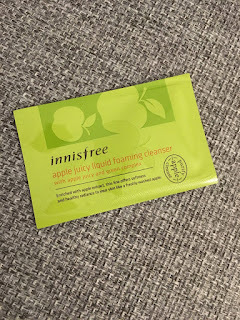 But I do quite like the Innisfree apple juicy liquid line as I use their makeup remover Innisfree Apple Juicy Emulsion Lip & Eye Remover now in my daily routine. So I thought I'd give this cleanser a try. 1. Rich, delicate bubbles interact for effective, deep cleansing. 2. Organic acids and vitamins from apples remove dead cells from the surface of skin and open pores for effective, deep cleansing. 3. Enjoy the sweet and sour scent of apples! I think the last point in the description was either lost in translation or translated incorrectly. There is no foam to squeeze out as this liquid foaming cleanser comes out as a clear liquid. It's quite watery, which is what I don't like about it because it runs off your hands. It also doesn't foam very well. Add those two together and you've got to use a lot of product each time you wash your face, especially if you're like me and you use a Clarisonic Mia 2. I only got one sample of this, and since it was so runny I could only get 2 usages out of this. 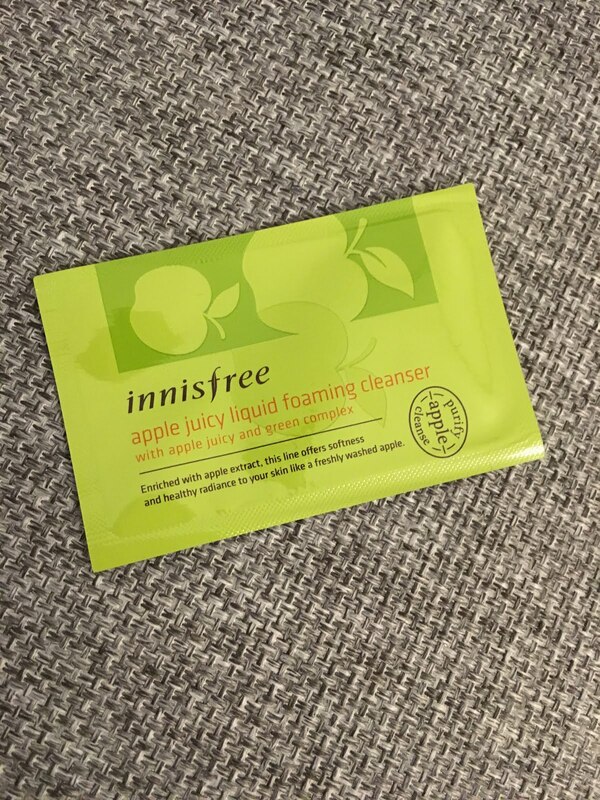 Other than the nice apple scent, I really didn't see any reason to choose this cleanser over others. I didn't break out or anything and I had no clogged pores, so from that standpoint it seemed to clean well. But I didn't really feel like my face was clean. I felt like most of the cleanser dripped off my face as I was trying to make it foam! And because it doesn't foam well, it was hard to make sure I covered all aspects of my face with the cleanser. It's just not user-friendly, especially compared to other cleansers in this price range, like the Skinfood Egg White Pore Foam or Etude House Baking Powder Cleansing Foam Moist. So naturally, I won't be buying a full sized version of this. Quality: 3/5 because I don't feel like much of the cleanser went on my face. I felt like it just dripped down my face because it was so runny! Value: 2/5 because you need to use A LOT for a foam to lather and for it to not drop off your face!